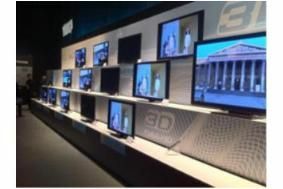 Panasonic launching exclusive 3D LCDs for Europe | What Hi-Fi? The big news is that along with the previously announced DT30 series, Panasonic is also launching a second 3D LCD series, called DT35, exclusively in Europe. Both of these new series (Panasonic's first 3D LCDs) consist of a 32in and 37in model, and are expected to appeal especially to gamers. Both are LED-backlit models with 400Hz motion processing, a 178-degree viewing angle, and include the company's new VieraConnect cloud internet service, which includes a dedicated App Store where users can download and install new applications and games. The tech specs of the two series seem to be the same, but the DT35 boasts a very slim, titanium design. Masayoshi Fujii, Panasonic's head of 3D, says that in 2014 32% of all flatscreen TVs will be 3D, while over 40% will have internet services, and the company aims to be at the forefront of both. But it will be at least three years before glasses-free 3D TV is a mainstream consumer option, the firm predicts. As has been mentioned before, Panasonic has long said that plasma is the best technology for 3D, but Fujii claims that thanks to the company's new IPS Panel, its own LCDs are significantly better than those from its rivals. Of course, plasma is still the company's technology of choice at larger screen sizes, and there will in fact be more Panasonic plasmas this year, both 3D and 2D. All Panasonic TVs, from 19in upwards, will include Freeview HD tuners this year. That's a big contrast with Toshiba's announcement earlier today. Other news is that Panasonic will only release one 2D Blu-ray product in 2011 – the entry-level DMP-BD75. As for the rest of the range, from players to recorders to systems, it looks like they'll be 3D across the board. For example, all its 2011 Blu-ray systems – which start with a 2.1 design and include 5.1 and soundbar packages – will be 3D-capable. And the company will update its Blu-ray recorder line-up with a 3D model in 2011. It will be positioned as an "HD value box" to store and enjoy all your media. For a breakdown of the full Panasonic range, including pics and specs, see our complete blog.